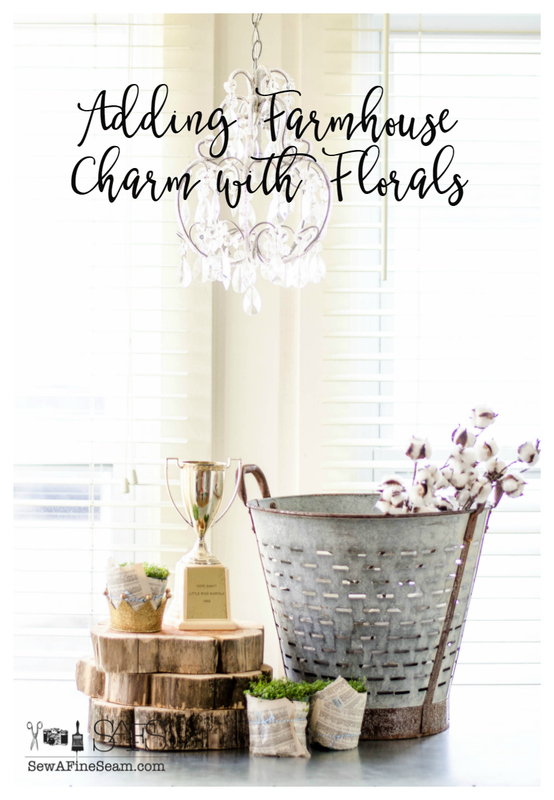 Welcome to another Farmhouse Friday where we are all sharing how we use florals in our homes. 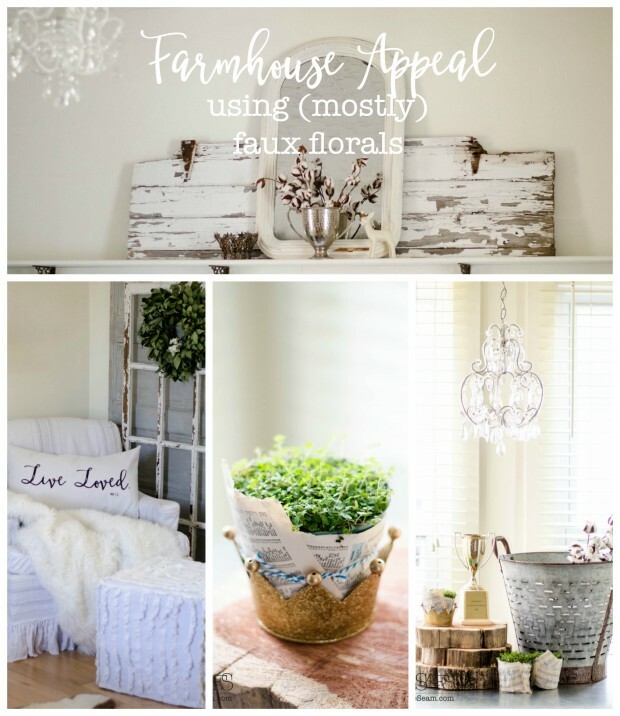 I’m going to show you how I went about adding Farmhouse Appeal with (mostly) Faux Floral. Time out – WHY does spellcheck insist on saying ‘faux‘ is misspelled?! I have amassed a nice stash of faux floral pieces that I like. I’m picky, I want them to look real even though they aren’t. That’s why I call them ‘faux’ instead of ‘fake’. The fake stuff is the stuff that screams ‘I’m a plastic flower’. The faux stuff regally impersonates the real thing and does such a good job that occasionally the observer leans over and sniffs them, thinking they are, indeed, real. 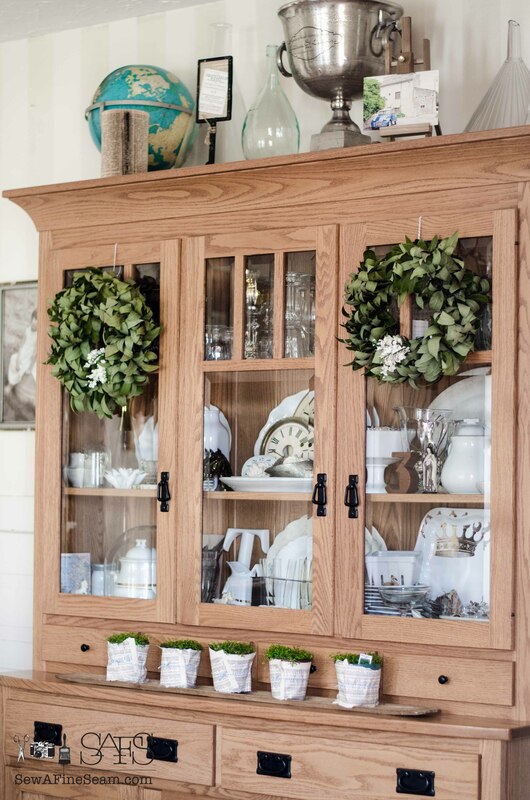 In my dining room I still have the bay leaf wreaths hanging on the china hutch from Christmas. I tucked some faux lily-of-the-valley into the wreaths for a touch of spring. The row of plants are Baby’s tears that I ordered to sell at the shop. I tore a back page from an old atlas into strips and wrapped around the pots and tied it with baker’s twine. You really should see this rack now (and most of the time) – it’s covered up with coats. Why does my family think I hung this here for them to hang their coats and hats on??! The bouquet of faux peonies I’ve had for years. My Mom bought them for me for Easter years ago from a boutique shop. 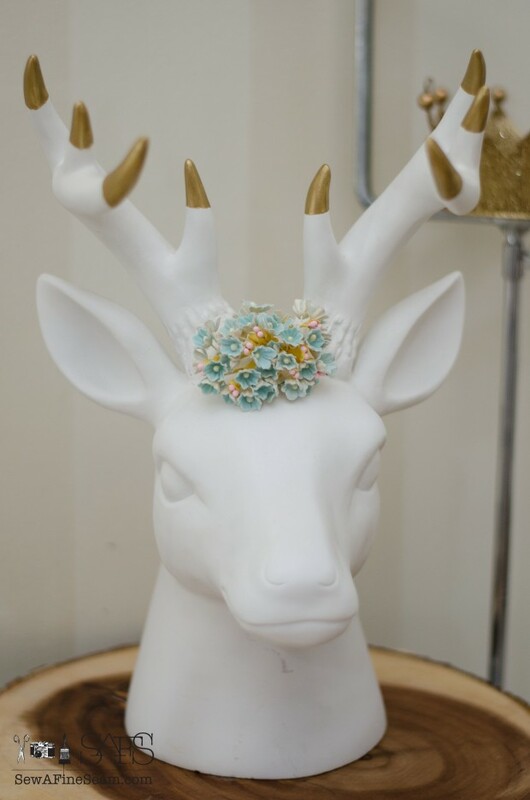 Deer head got spiffed up with some vintage inspired paper flowers – I’ve had these for years too. The white flowers beside the microscope are dried flowers I got several years ago at a shop in Columbus. I have no idea what flower they are but they are white and I like them a lot! Is it wrong to put flowers on a buck head? I think he looks quite charming 😀 And the flowers go really well with the gold-tipped antlers too. 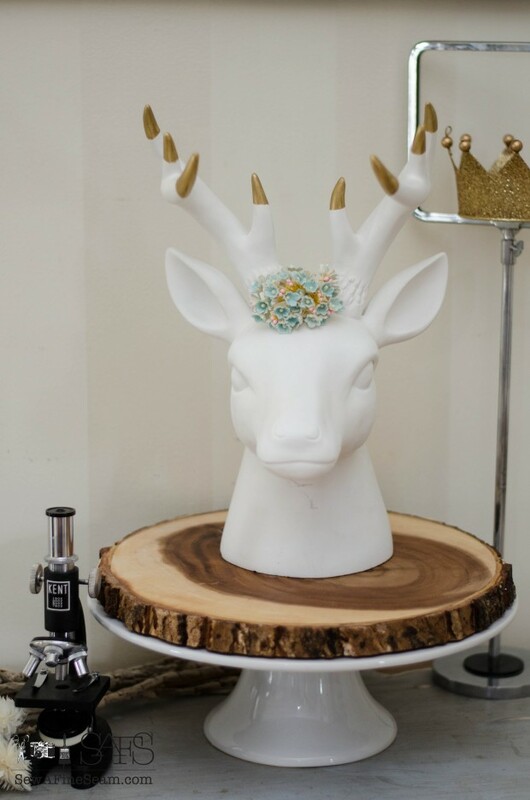 Buck head is from Target a couple years ago and I added the gold to the antlers. My dining room nook. 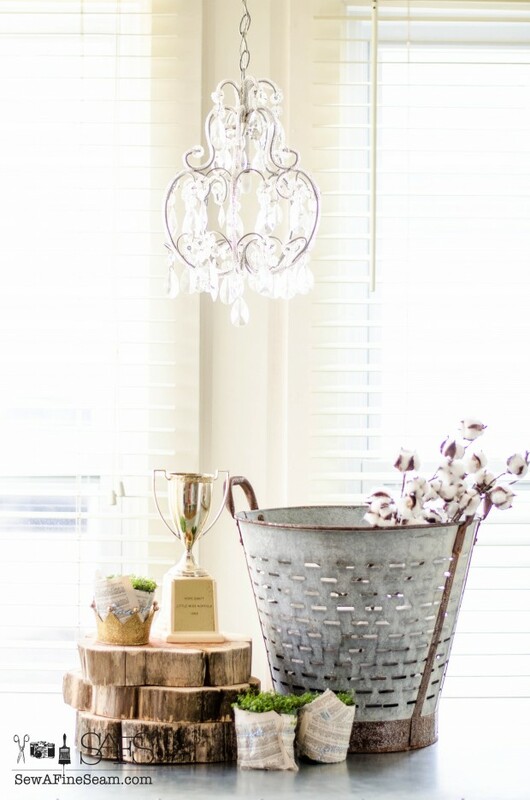 Wood slices, olive bucket, trophy cup, baby’s tears and cotton stems. And a chandi. 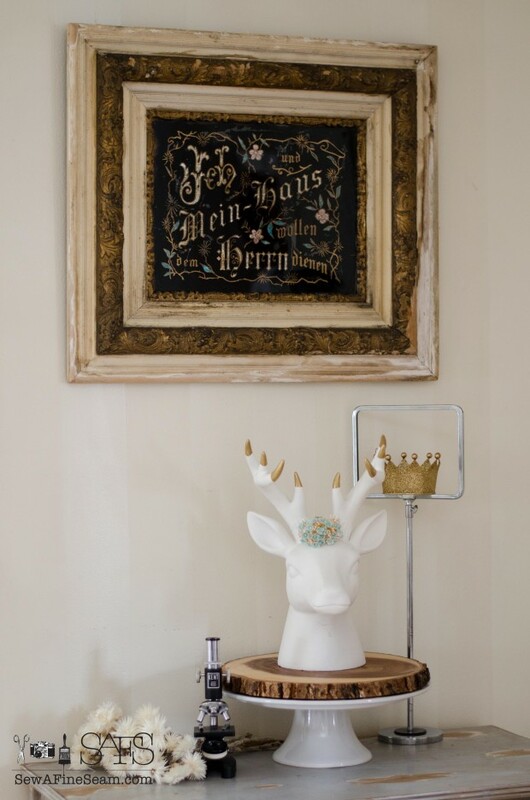 The crowns were from Target at Christmastime – they are ornaments but I love them for all-year use in my decor. Here is a peek at the new furniture piece I recently added. It looks a bit large and overwhelming for this space but it’s so huge I don’t have much choice on where to put it. It’s actually two old architectural files stacked together and I purchased it at a benefit auction for an adoption fundraiser. And I need it. This kind of storage was so desperately needed for my patterns and stencils and for my girls artwork. So I knew I had to make it work somehow. I’m hoping that giving it a paint job with some white paint will help the massive size not stand out quite so much. The darling little microscope is real and has the most adorable little wooden storage box. I found it at a garge sale for $2. Yeah, I know, I still can’t believe it! 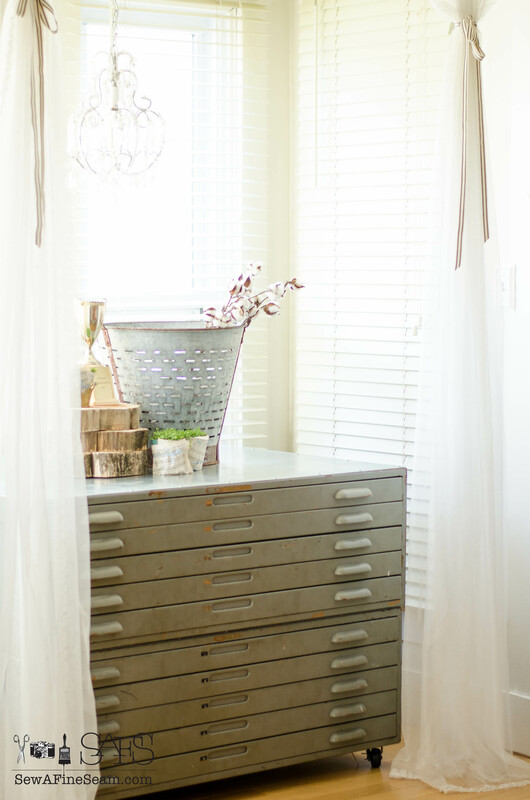 This vintage desk drawer that I used last fall for decor showed up again in the Spring decor! The faux ranunculus is my fav of my faux floral stems. Little details of spots I tucked floral touches. 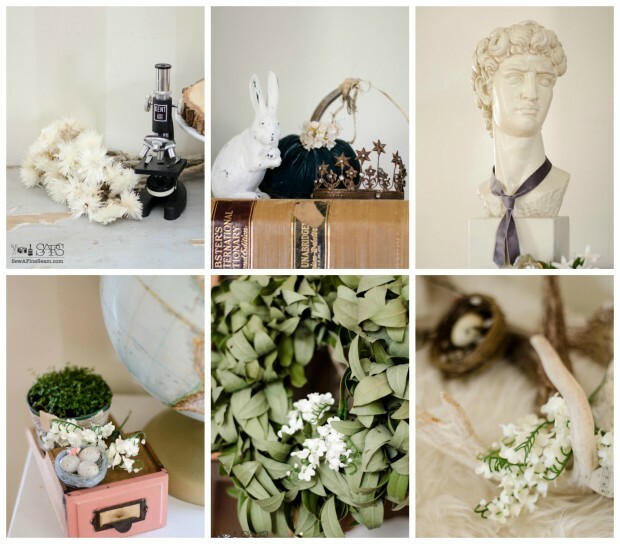 I have been known to buy fresh flowers for Springtime decor too – you can see my Spring Tablescape with fresh flowers or my Mom’s kitchen makeover photoshoot when I bought cabbage roses to use in the shoot. What looks more farmhouse than an old, chippy wood barn door? 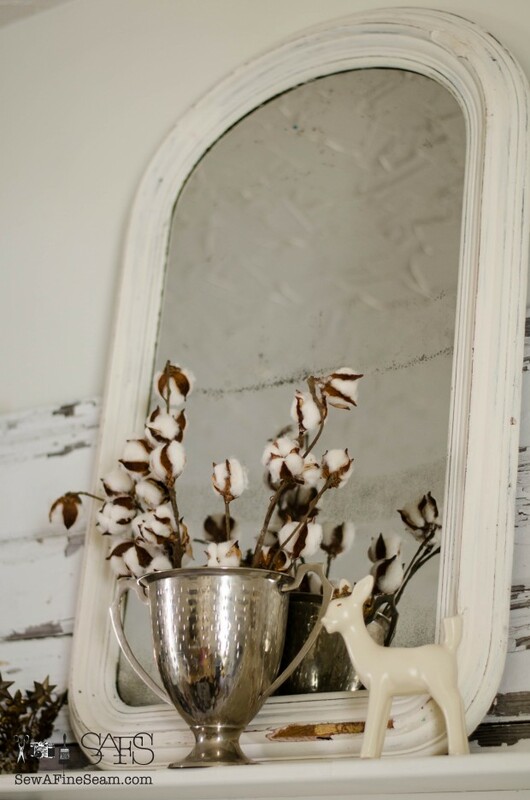 In anticipation of spring I took down the pompom garland I’d added to this mirror for Valentine’s and added a trophy cup with some cotton stems. I love how the mirror reflects the cotton and totally hides the fact that I really needed another cotton stem or two to fill out the bouquet properly! I love it when my living room is neat and tidy and fluffed and pretty. I’m looking foward to Spring but it’s COLD here now and my fur blanket still gets used daily. I tucked a few more lily-of-the-valley into the wreath beside my chair and also added my newest pillow. 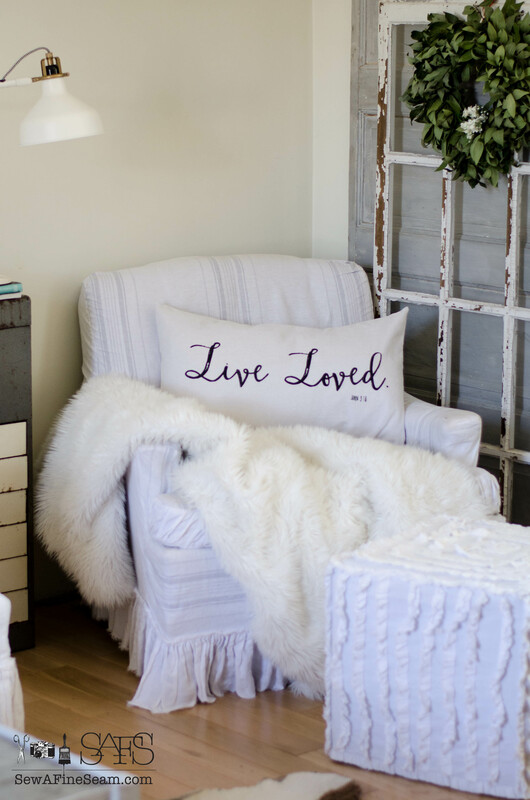 This was suggested by my sister and it’s the first pillow I’ve done in screen print. Several more in the works! My little deer took off his plaid tie and packed it away till Fall but he retains his spot here. He feels at home here and I still like how he looks here. Baby’s tears topped with little crosses. The crosses were from an art project my oldest daughter did when she was in about the 3rd. grade and I’ve kept them. I pull them out every year and do something with them as a visual reminder of what Easter is really about. The sheepskin rug hasn’t been packed away yet so I tucked a few floral stems here as well to gently speak of spring. 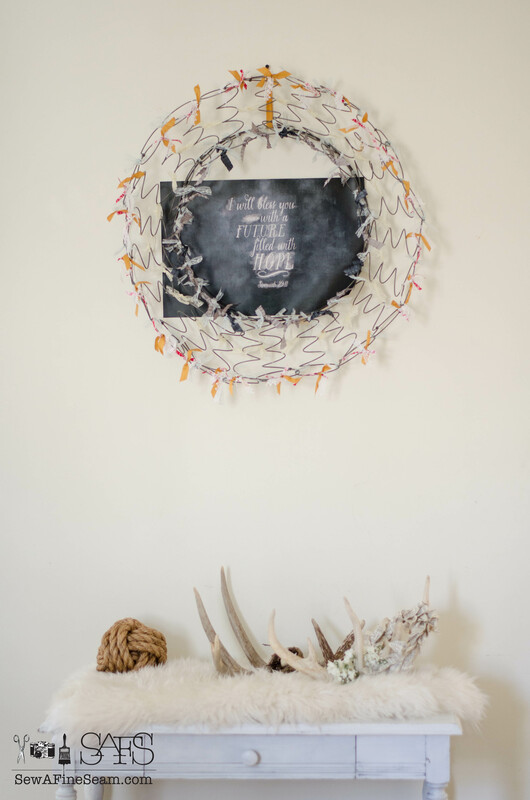 And the ‘spring’ wreath is a fun bit of industrial whimsy added here too. You can find the instructions for making this here. 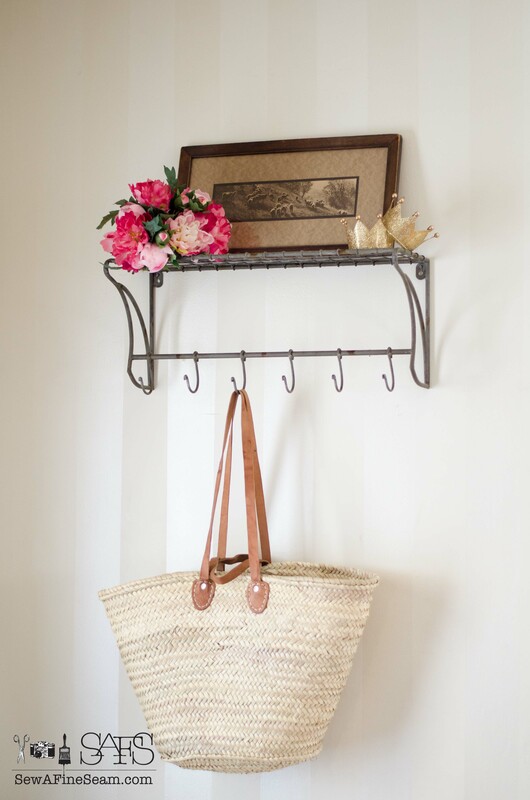 Now go check out how my friends used Floral in their homes! 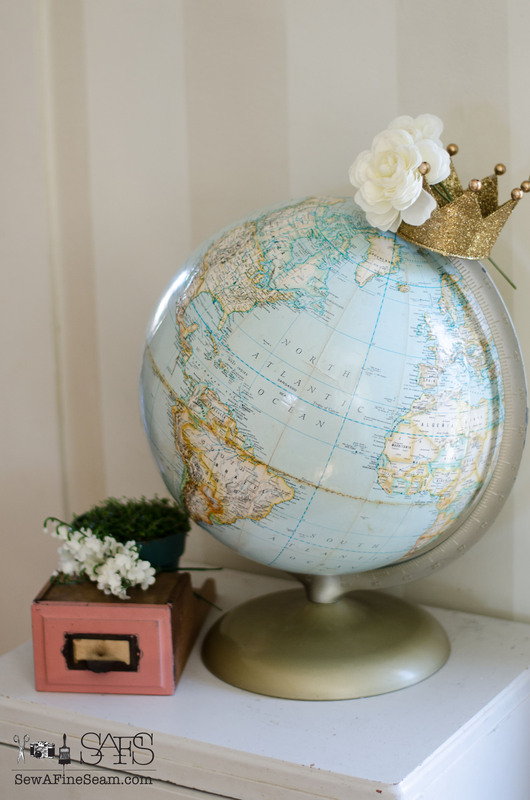 OK, jealous of the microscope and crushing on your globe with a crown on it! You always have the cutest ideas. And I’ve often wondered why spellcheck doesn’t recognize faux too! It’s a real word. Really it is!!! Thank you Pam! I love crowns 🙂 partly because my maiden name was King 🙂 and spellcheck totally needs an overhaul!! Love the baby tears in crowns, Jill! 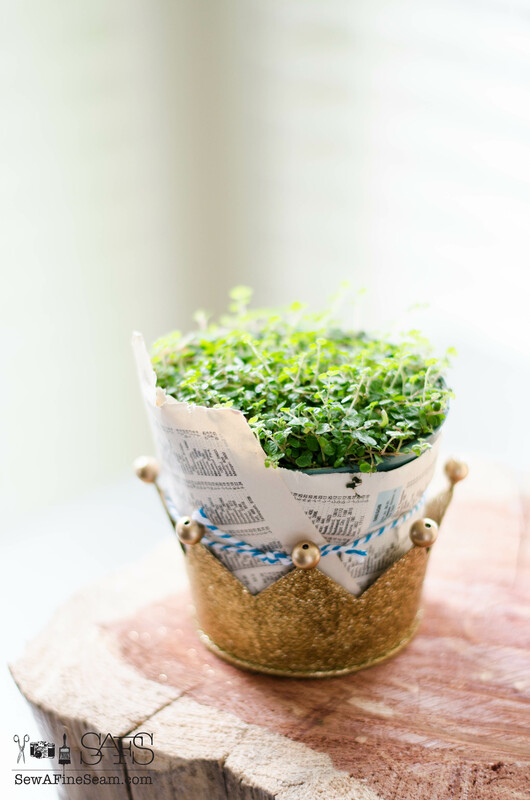 Such a cute idea to tuck the crosses inside for Easter. Thank you my friend! 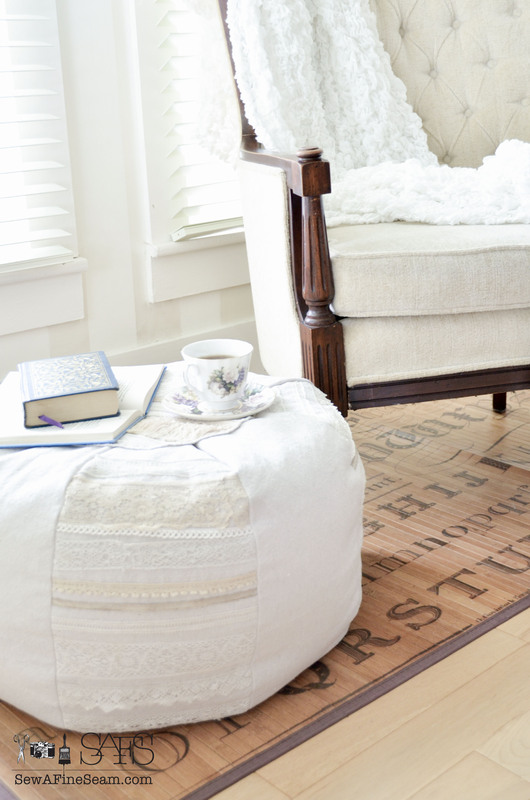 I love using the little crosses especially since they remind me of when my oldest was just a little girl! Oh, I just love those baby tears in the paper pots. 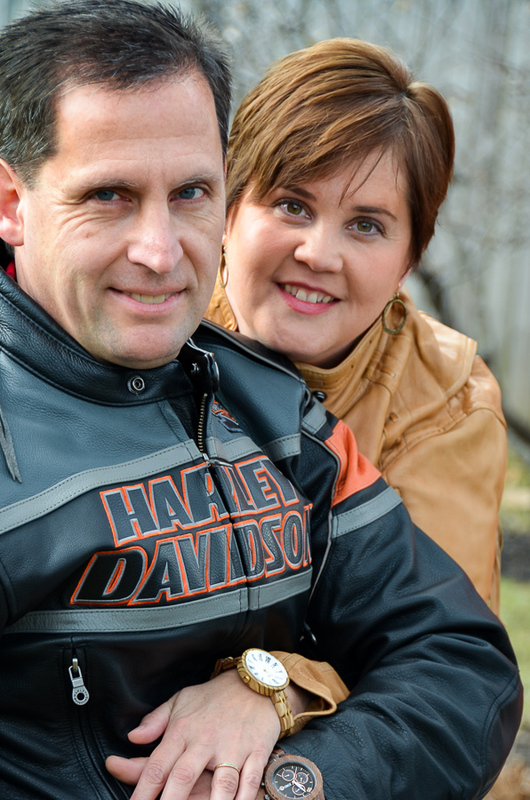 Just darling, Jill! 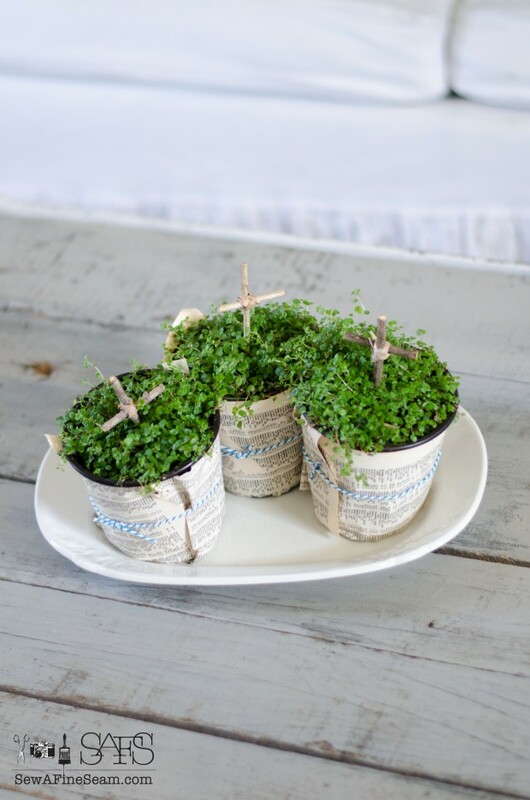 Thanks Yvonne – baby’s tears are my fav spring plant I think! 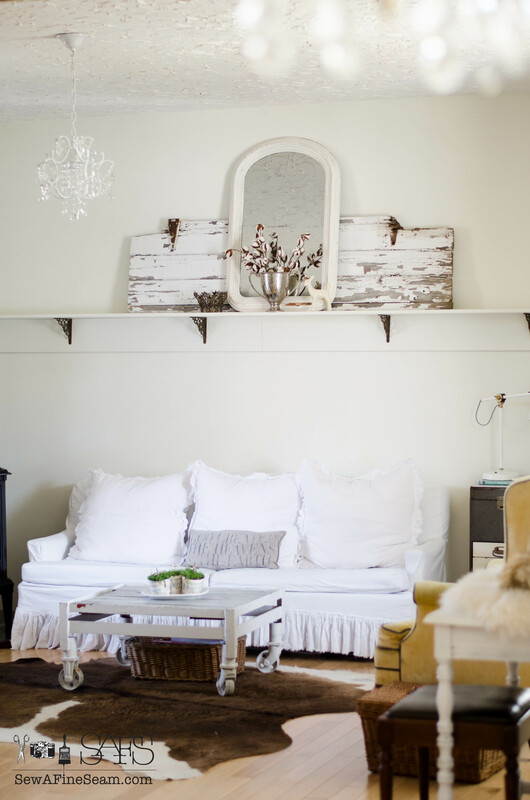 All your vignettes are so sweet! Thank you so much Susan! 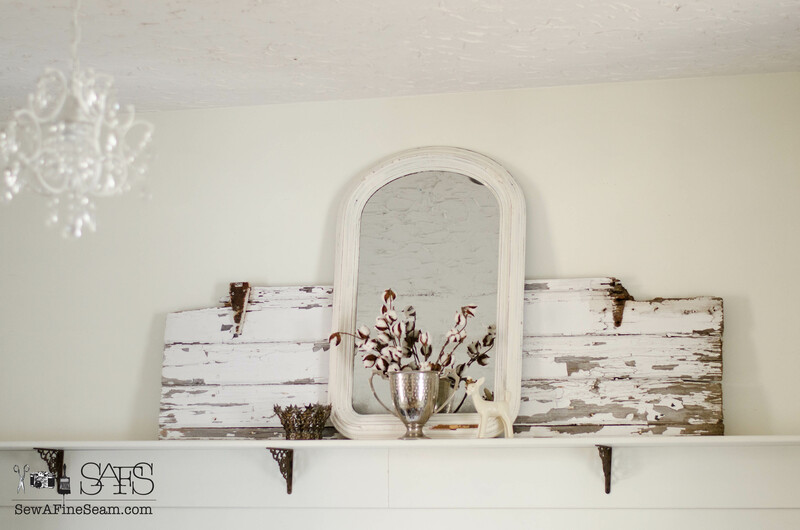 Vignettes are so fun to put together – I especially like creating them for spring. Thank you so much Suzy, I love using baby’s tears each year. And I totally think spell check needs an overhaul!!! I’ve been trying to think of a new plant to buy for the house and you gave me the idea–Baby’s Tears. I have just the pot to put them in. This would also be a good table centerpiece (with a small cross) for our sunrise service at church this year. Thanks for the ideas, Jill. 🙂 Glad you loved the idea Tricia – and I think that would be awesome for Easter at church! Your photos are all so pretty makes me want to get started on my spring decorating but I am trying to hold off just a little longer. Spring seems to come to Minnesota a month after everywhere else. LOL. I am a big fan of fuax flowers also… so much more bang for your buck. Thank you Robin 🙂 We are having spring like weather this week – but it’s not what we always have in march by any means! I’m sure it will get cold here again unfortunately – I’ve seen it snow in April. Have a happy day!